So I always said I would never have any other tattoo after my first one of Africa (see previous post) but recently I was really thinking of having another but of course, it had to be very meaningful. I had never thought of having a tattoo before because I never liked the idea of having something drawn into our skin for life without it meaning or representing something. I don’t like pointless tattoos. So for me, the one thing that has been close to my heart since childhood is Africa so it is basically the most meaningful tattoo I would get. 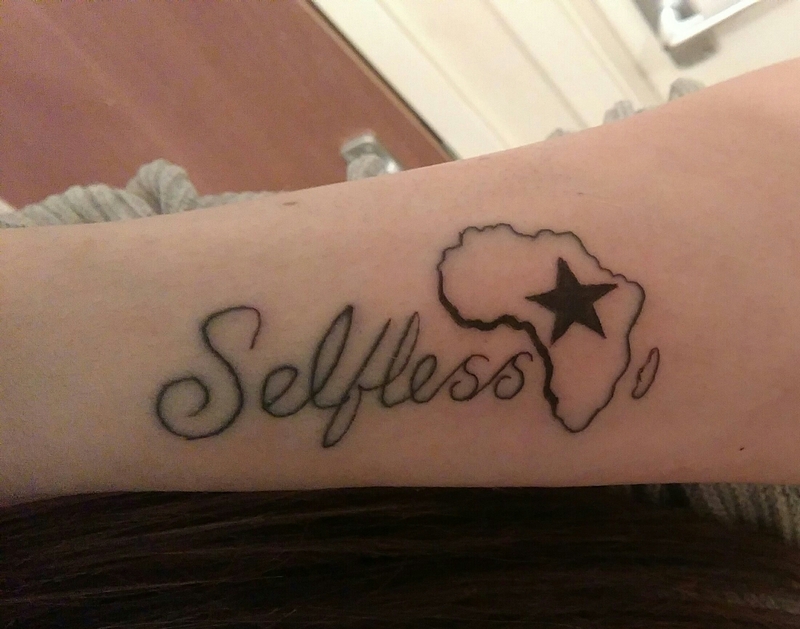 As you can see, my second tattoo is Africa with a black star in the middle and the word selfless next to it. So let me explain what this tattoo means to me. First of all, I had the word selfless put there because I believe I am a selfless person and being selfless means everything to me! I believe in helping those who need rather than always thinking of yourself. Secondly, the African continent, this is of course to represent Africa and how much I love and cherish Africa. I am proud to represent this continent in all shapes and forms for a thousand reasons! And last but not least, the Black Star in the middle of the continent. This represents GHANA. The black star of Ghana. The black star of independence. Need I say why I have chosen to add this to the tattoo? Lol of course I had to add part of Ghana when Ghana is a second home to me. I have been welcomed into Ghana like it was my home town! Nice tattoo. It’s great to see how much you love Africa.